Your kitchen is the heart of your home. Whether it’s for the preparation of family meals or for hosting parties with friends, your kitchen is one of the most-used rooms and is often the central hub for gathering and entertaining.When you’re ready to upgrade your kitchen, get in touch with FiberPol. Our kitchen remodeling company offers four different types of kitchens to suit every style and budget. Every kitchen remodel starts with your space and your vision. Then our kitchen remodeling team will get to work designing and building your dream kitchen. Are you tired of the existing layout or finishes of your current kitchen? You don’t have to settle for a space that has become obsolete — new countertops and kitchen cabinets can make all the difference! At FiberPol, we specialize in designing and remodeling services that will help you create your dream kitchen! We offer a wide range of kitchen remodeling services and materials, and our experts will help you choose the right fit for your home. Kitchen remodeling projects and updating the appearance and layout of cabinets and countertops can be stressful, overwhelming, and time-consuming. 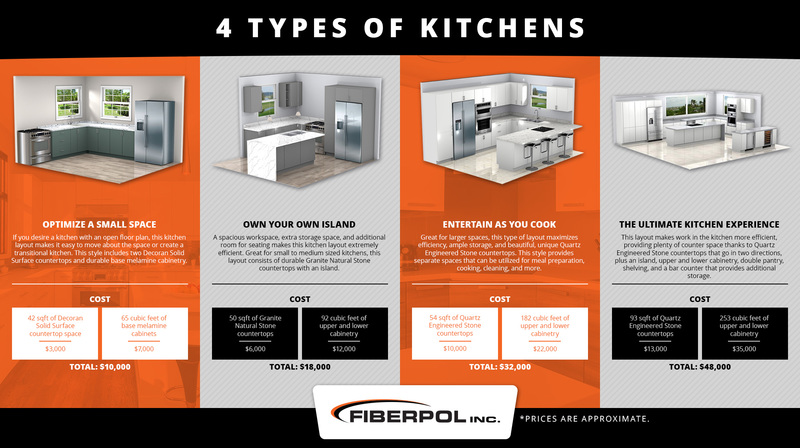 But at Fiberpol, we want to make your kitchen remodeling project easier on you by offering four different types of kitchen designs to choose from. Each kitchen plan offers different conveniences and features, and some may be more well-suited for particular spaces than others. Review the design types below to choose which will be the best for your kitchen. A very efficient use of space, this classic kitchen type fits many homes. This layout consists of two adjacent, perpendicular walls. The layout creates an open floor plan, making it easy to move about the space or create a transitional kitchen. The amount of storage is one of the most appealing advantages for homeowners to opt for L-shaped kitchens. It has two Decoran solid surface countertops, one side shorter than the other, hence it is most suitable for kitchens with limited space. Durable base melamine cabinets provide you with the storage you need. This kitchen style offers an easy and organized kitchen layout giving two work zones within one kitchen. If you’re searching for a kitchen that is extremely efficient and has a generous workspace, storage capacity, and seating, this kitchen style is just what you need. 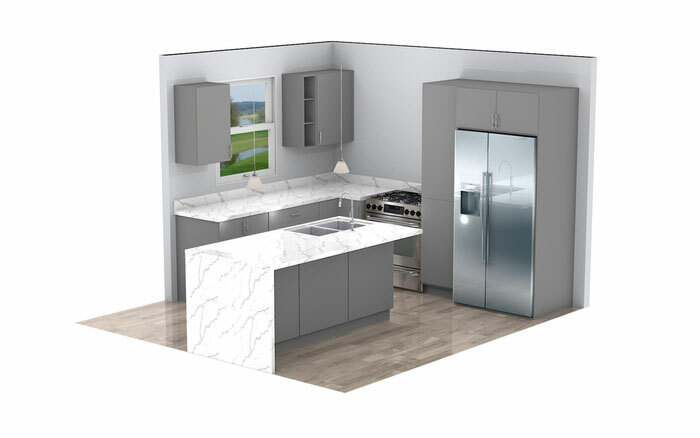 Great for small to medium sized kitchens, this layout consists of durable granite countertops on two adjoining walls that are perpendicular, with an added island that provides extra cabinets for storage and an informal dining space for the family. This kitchen style retains an open layout feel while adding additional space for preparing meals or entertaining guests. 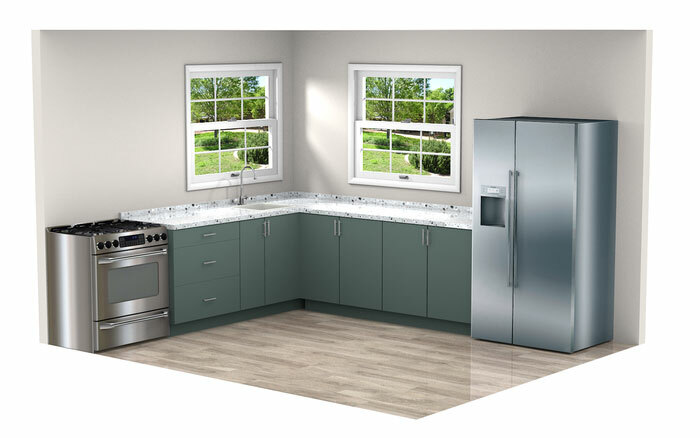 This kitchen style is suitable for larger kitchen spaces and offers a great option for families who spend a lot of time prepping and cooking meals for entertaining guests in the kitchen. 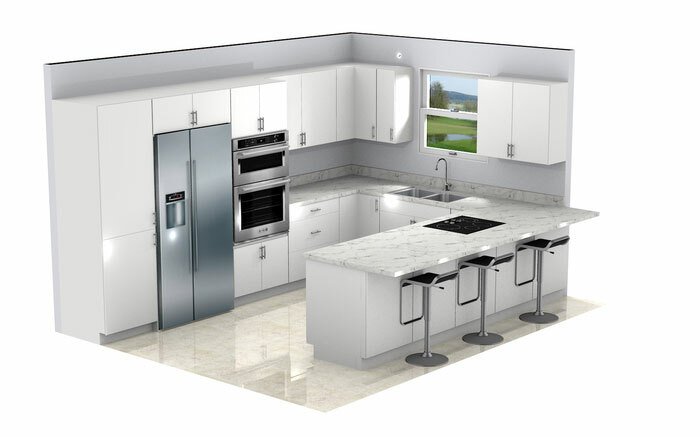 This type of layout maximizes efficiency, ample storage, and beautiful, unique Quartz Engineered Stone countertops. Configured of three adjacent walls of cabinetry and benchtop, this kitchen style provides separate areas that can be used for prep, cooking, cleaning, and more! It features upper and lower cabinets on two sides, plus an opening on the other. Whether you have a large, light, and spacious kitchen or have a small but equally mighty space, opting for this design is not only a practical decision, but has plenty of style potential, as well. 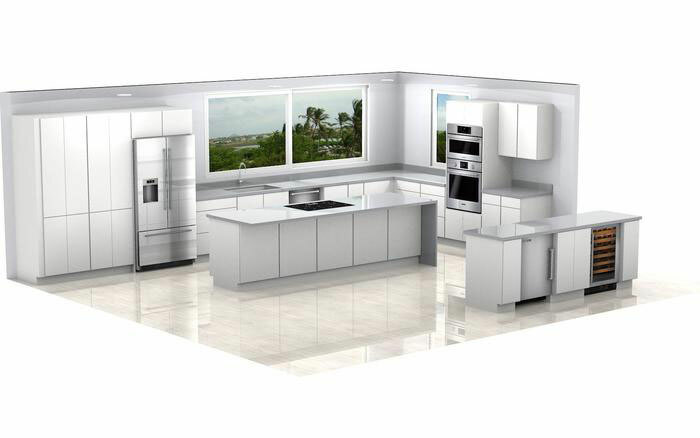 When designing your kitchen layout, there are a variety of factors to consider. Before deciding on the design, it is essential to make sure that you are efficiently maximizing your kitchen area by choosing a layout that provides sufficient storage, countertop space, and work areas.